The video game takes place in the context of Season 7, the last season of “Buffy the Vampire Slayer.” The slayer and the Scoobies wage a huge battle against The First — the source of all evil who first appeared in “Amends” in Season 3 and then became the Big bad in the final season — and players can take control of the slayer in the epic fight. 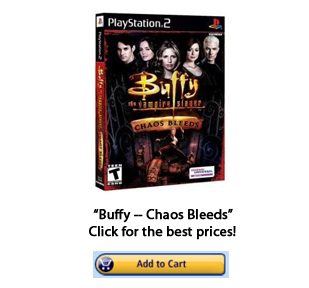 “Chaos Bleeds” comes after the first “Buffy” game (see the versions for the Xbox and Game Boy Color) that was a third-person piece of software in which players play Buffy and fight various demons and vampires that want to cause yet another Apocalypse in a setting that resembles the early seasons of the television series. The Buffy-controlled player in this game gets assistance from Willow, Xander, Giles, Angel, and Cordelia while foes including the Master and Spike makes appearances. In the original video-game before “Chaos Bleeds,” nearly all of the characters’ voices are performed by the original actors and actresses and its settings include Sunnydale High, the Bronze, and other locations — which all have highly-detailed graphics and occur within an intelligent fighting-scenarios. In contrast, “Chaos Bleeds” has characters that can execute at least 100 combat-moves using a wide variety of mystical weapons along with multi-player ability for six people. Another prior game, “Wrath of the Darkhul King,” was also released for the GameBoy Advance. Which “Buffy” Game Do You Want?